A country’s incorporation into GVCs has significant implications for its trade performance. We tend to discuss the benefits of regional trading blocs such as ASEAN, NAFTA and EU simply from the perspective of low trade barriers and ensuing greater volume of trade among members. However, trade dynamics in the world’s most vibrant trading blocs do not stay at the expansion of trade volume, but rather dive deep down into the multilayered emergence of production network or value chains. Deepening global value chains (GVCs) have underpinned international trade growth in recent decades. This has also been supported by major developing economies’ incorporation into global trade mechanisms under the World Trade Organization system, and by the advancement of mass transportation through container logistics. But the recent stagnation of GVCs means that they may have reached a mature stage and lost steam in spurring the international trade growth. Slow as it may be, however, GVC expansion is still progressing. As measured by the portion of goods and services crossing border more than once out of total exports, the global GVC participation rate hovered at around 73.7%-74.1% during 2011-2014, then rose slightly to 75.8% in 2015, and 76.7% in 2016. This might have contributed to the recent recovery of international trade growth. Historically, Asian countries have shown lower levels of GVC participation, around 67%-69% since 2011, compared to 71%-74% for NAFTA countries (US, Canada, and Mexico), and 73%-75% for EU countries. Yet, Asia’s regional trade integration is no less strong than other regions. Reflecting Asia’s strong intra-regional trade integration, captured by their trade volume with regional partners out of their total global trade at 57% in 2016, Asia’s regional value chain (RVC) participation rate in the same year was 77.2%. This compares to 77.3% for NAFTA, and 77.6% for the EU. 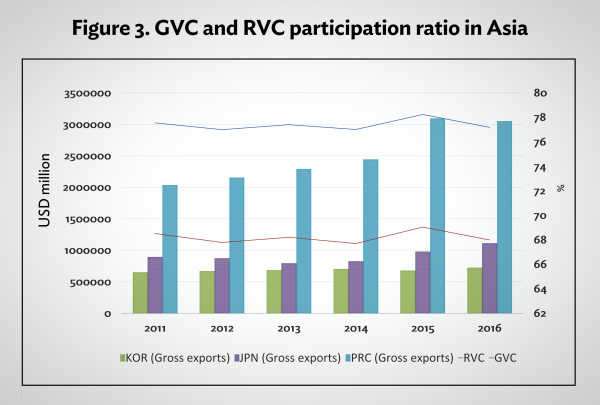 A much wider gap between GVC and RVC participation ratios for Asia than other regions signals very robust regional trade bias in the region. For example, in the People’s Republic of China (PRC) export performance had a whopping 0.94 correlation with its GVC participation rate in 2011-2016. This is much higher than Japan’s 0.63 and the Republic of Korea’s 0.37, suggesting the PRC’s huge trade gains are largely due to its GVC participation, or vice versa. The UK is a case worth noting among EU countries, showing a 0.83 correlation coefficient, while both France and Germany demonstrate negative relations. Among the three NAFTA countries, Canada records the highest GVC participation ratio at 80% in 2016, but the ratio is the most closely associated with exports performance in the US, at 0.84 of correlation coefficient. This may not suggest a causal relation between a country’s GVC participation and its export performance. Nevertheless, it’s clear that we cannot understate the potential impact of deepening GVCs on export performance in the PRC, UK, and US. Looking at the relationship between the progress of regional trade integration and an individual country’s trade performance can provide a glimpse of the potential impact of regional trade integration on national trade performance, and vice versa. Asia shows much higher RVC than GVC participation rate with a wide margin. 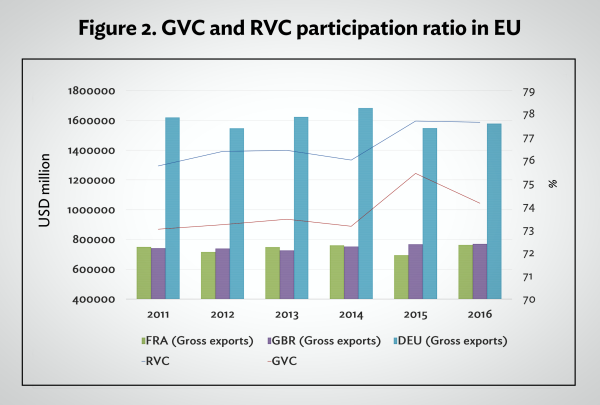 The series of RVC and export performance of individual countries does not reveal a clear trend. But the correlation coefficients for 2011-2016 indicate a robust 0.45 correlation for the PRC’s gross exports with RVC progression, much higher than for Japan and Republic of Korea. Among the top EU countries, the UK has the highest correlation at 0.74, while the US leads NAFTA countries with 0.96. Although the correlation coefficients do not capture the probable causal relation, these results point to a potential significant impact of Brexit and a dismantling of NAFTA on UK and US trade, respectively, as well as to the regional trading blocs themselves. 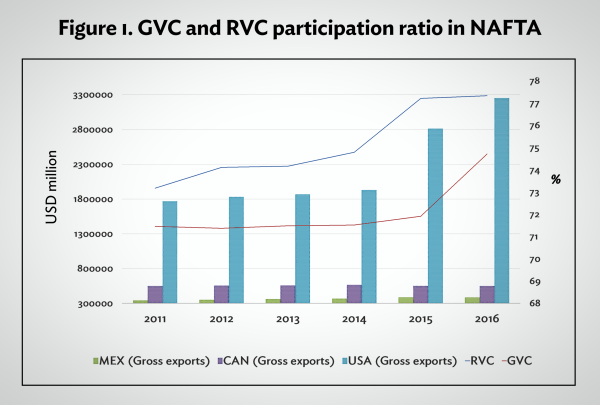 Furthermore, the correlation between NAFTA’s RVC participation ratio and a one-year lag of US exports performance is a high 0.91, while that between a one-year lag of RVC participation ratio in the EU and UK exports reveals an equally high 0.90. This could imply that US trade has relatively high stakes for NAFTA, as EU trade has for British membership in the EU. Asia has made rapid progress on intraregional trade integration. However, the relatively low level of RVC progress compared to other regions hints at much larger potential for trade growth, to be realized by deepening regional value chain linkages. Two crucial ways to help achieve this goal are concluding mega trade deals such as the Regional Comprehensive Economic Partnership, and pushing for trade facilitation to lower non-trade barriers among regional trade partners.